HighBaller Reviews - What Is HighBaller And How Does HighBaller Work? HighBaller Reviews – What Is HighBaller And How Does HighBaller Work? HighBaller is a massage device which is adjustable. It is designed to help release tight muscles and improve ergonomically. 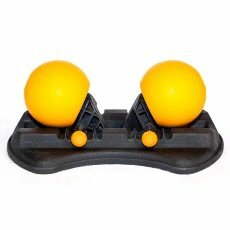 It consists of two massage balls which rotate on a stand that is adjustable. It works to improve the muscles tightness which the user gains without much strain on the workouts. It also helps to improve the user mobility and the recovery process. It has two techniques that the user should use. This includes rolling the muscles on the device which helps to improve the lymphatic and venous flow. This ensures that the pressure is reduced, soft tissues are released and give the user a soothing massage. Pushing is also a technique that the user is allowed to use when using the device. This helps to relieve the trigger point. The price of the device varies depending on the user pledge where they can pay as little as $5 or more for a trigger point map and updates on the projects of HighBaller. The HighBaller and a trigger point map cost about $44 or more. Also, the user can pay about $84 or more for a workshop the includes the trigger point, fascial release, trigger point map basics of anatomy, a HighBaller, special movements and techniques, and free access to the workshop online. It is available on the manufacturer official website. It is an effective and safe method of improving the muscles tightness. What are the HighBaller Claims? The HighBaller claims to improve the user comfortability and reduces the fatigue. This helps to release the muscle tension and strain. It also claims that it naturally relief the muscle tightness and improve the flexibility and mobility of the muscles of the user. HighBaller Review: How HighBaller Works? The HighBaller works by targeting the muscles tension and strains. It reaches all the regions with tight muscles. This ensuring that it releases the tension in any region despite being tight. It allows the correct postural and joint alignment by improving the user flexibility and mobility. This also prevents the user from getting injured and reduces the muscle pain. It helps to improve the metabolism in the muscles. This ensures that muscle edema is reduced. It also adnate tissue and open tight muscles. Adjustable stand – It helps the user to adjust the balls according to the muscles group and tightness. Trigger Point Map – It gives the user the techniques, direction, and the trigger point location that exist. Round shape ball – This helps to massage the muscles deeply on target and specific areas. It improves the user flexibility and mobility. It improves the user recovery. It prevents the user from injuries. It helps to minimize fatigue. It gives the user comfort. It helps to release tight muscles. It helps to improve the muscles of the body. It helps to treat and reduce muscles pains. The manufacturer does not mention if they provide a money back guarantee if the user is not satisfied with the device. The user should start by adjusting the width of the balls. The user is advised to make the ball wider where the muscle group is large. The user should also make the balls narrow when they have a deep and tighter muscle groups. The HighBaller has no known side effects. The manufacturer claims that it is designed in a way that is adjustable and it natural relief the user muscles tightness.